→Right To Sleep Article With Cases : Is Sleep a Human Right ?? Right To Sleep Article With Cases : Is Sleep a Human Right ?? Are you aware of your rights? Ever heard of this one …. Right To Sleep ?? For more Useful notes and important updates,Like our FACEBOOK PAGE and keep yourself updated with UPrepareLaw. Imagine yourself as a student in a boring lecture. You keep on yawning, your eyes keep on closing and suddenly without you realizing everything goes blank you are asleep. In another 5 minutes there is a tap on your head. You come to your senses. There she is, your teacher with a mean look on her face, standing right in front of you. Whether or not you get to be , either the class hero or the teasing stock of your classmates is up to your knowledge of this right,that is,right to sleep. Right to sleep article with case : Is sleep a human right ? In continuous and crucial developments regarding this issue , that how does the Parliament and the courts of India view the citizen’s right to sleep. Sleep is imperative for healthy living. This fact is established and unquestionable. Keeping a person from sleeping will impair his mental as well as physical health. Medical professionals state that missing one night of sleep leaves you in a state which is comparable to being in a legally drunk state . Lack of sleep is responsible for causing major stress related disorders which if becomes a part of society’s lifestyle ,proves to be bane to the overall and cumulative functioning of society. The constitution as such provides the right to sleep as a derived constitutional right under article 19 (1) (a) read with article 21 which establishes right to decent environment. We have right to live in peaceful environment, right to Leisure and right to sleep. All these form necessary ingredient for right to life. Government also protects this right by putting certain safeguards to sleep , these are mostly in form of restrictions on noise or other pollutants impairing sleep. In fact there are legislations recognizing noise as a form of pollutant and restricting its unfriendly and hampering use . A prominent example of this is the limitation placed on the volume of music that can be used in parties and other functions . In another recent development on the matter. The Honorable Supreme Court in yet another judgment has increased the scope of citizens right to sleep. In the recent infamous case of Ramleela Maidan Incident V. Home Secretary the judgment states “Sleep is essential for a human being to maintain the delicate balance of health necessary for its very existence and survival. Sleep is, therefore, a fundamental and basic requirement without which the existence of life itself would be in peril,” the court said, terming it as a basic human right. The apex court passed the judgment while stating that the police erred gravely in its conduct . By using force to disperse the crowd which was sleeping peacefully in the Ramleela Maidan ground under section 144 of CPC. With regard to all the above information . 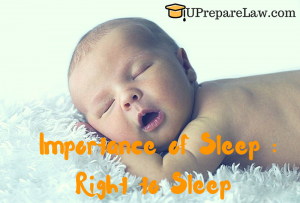 It would be safe to say that right to sleep enjoys the status of a fundamental right . Even though its not directly mentioned in our constitution. It is so because it forms a necessary ingredient of right to life . Now to answer the question asked at the very beginning of the article . No , right to sleep can not exercised while sleeping in class . Because no right is absolute and like all other rights , right to sleep is also subject to reasonable restriction . Its validity depends on circumstance and the occasion of its use.